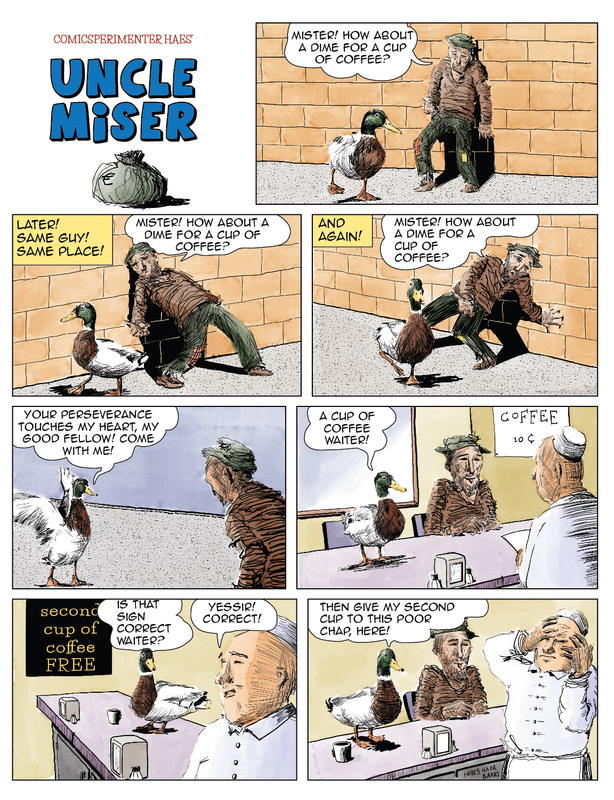 This comic is about Scrooge McDuck, a drifter and two cups of coffee. 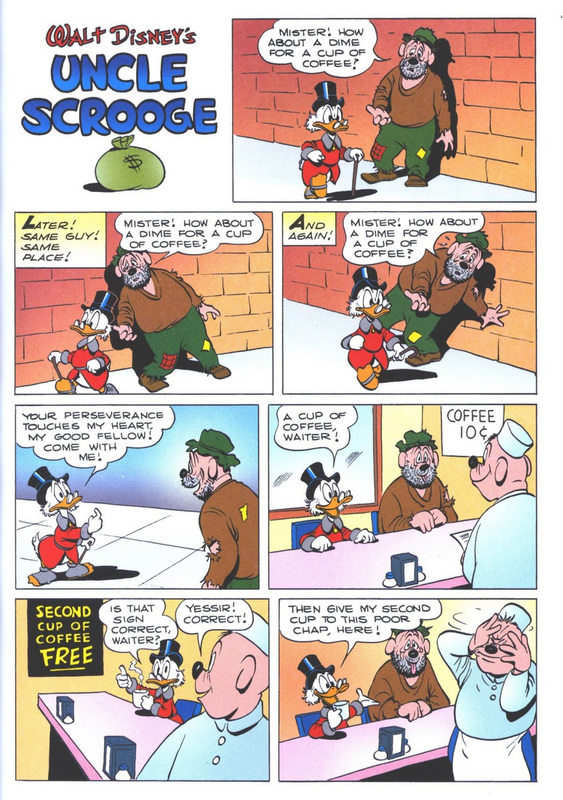 It might, since it is a panel by panel rendition of one of Carl Barks’ classic Scrooge McDuck one pagers, Coffee for two. Only, it’s rendered in a completely different, more realistic, style. For the Dutch magazine Stripglossy, I was asked to make a one page comic for three editions. Each one had a specific subject. My earlier entries dealth with a job interview and comic conventions. Though I absolutely love the Ducks (I grew up on them actually), they are such a specific genre and style of comics – one that is quite far removed from my own. I just wasn’t sure if I could say something worthwhile about it. So I decided to rephrase the question a little bit. Would I be able to use some of The Duck’s history to make a point about comics in general? COFFEE FOR TWO – FOR REAL! One of the common misconceptions about comics is that their (only) strength lies in artistic merit of the artist. Splash pages, realistic rendered characters, super detailed backgrounds, a lot of people consider this the benchmarks of whether or not a comic is successful. Successful comic stories use the mediums possibilities (timing, panels, words vs pictures, layout etc.) in a way to effectively get a point across. In most cases that would be, a story. Perfect pictures without cohesion or significance can easily turn into superficial if they don’t support a good story. 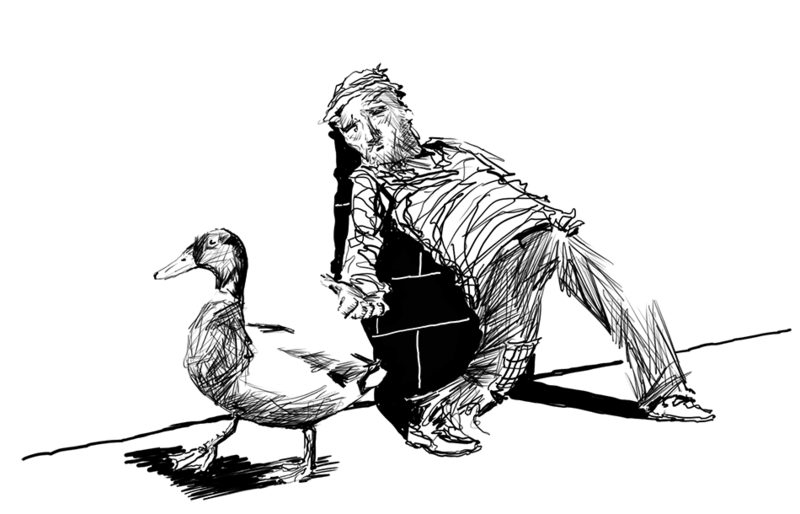 A nice splashpage without any emotional connection to the reader, simply falls flat. Yet, there are plenty of people who think ‘amazing’ art immediately makes for amazing comics. Just because you can render realistic deltoids, doesn’t make you a great comic book artist! I thought it would be nice to prove this point in a subtle way. By realistically rendering a Duck comic. An obvious choice was one of Carl Barks’ classic Scrooge McDuck comics. I chose ‘coffee for two’. It’s such a silly gag – but mind you, these Scrooge comics where quite something back in the day. Obviously Carl Barks went on to write and draw amazing adventure stories featuring The Ducks, but hey, I only had one page to work with. When you think about it, talking ducks are obviously very unrealistic. Let alone one being extremely rich. It’s so weird, why would a wino beg for money to… a duck?! Only when rendered (semi) realistically does the reader realize how much his or her disbelief has been suspended. Turning the gag into something that is – I think – hardly funny. That way I sort of created a worse version of this comic. All this to drive the point home that drawing style is such an important factor in comics. And that realistic drawings don’t necessary equal good comics. 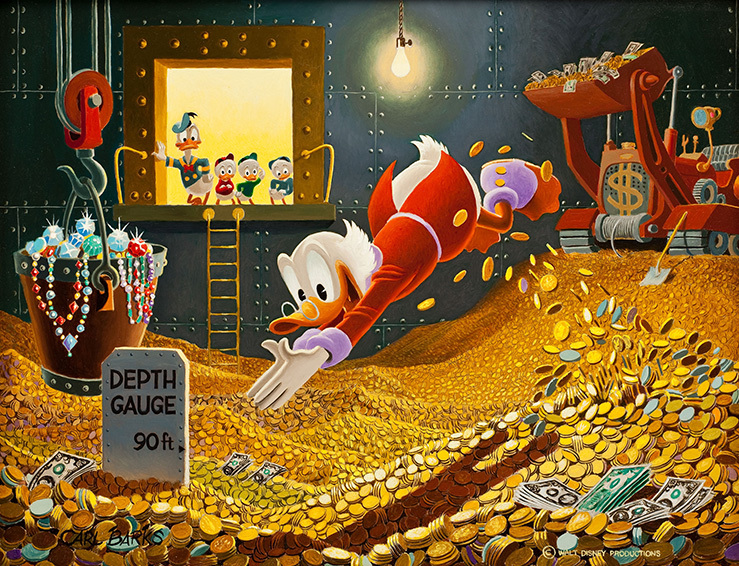 Did you know the original Scrooge McDuck comic? Did you indeed think it was less effective in this style?